If you prefer not to use your credit card online, you may call us at 321-430-4786, Monday-Friday 9am-5pm Eastern Time USA or fax it to us at 815-927-0294. 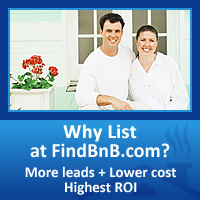 If you wish to pay by check, you may mail your payment payable to FindBedAndBreakfast.com to our postal address. If you are concerned about the security of paying online by credit card, please see our FAQ section on security. Please see our FAQ section on billing for refund information.